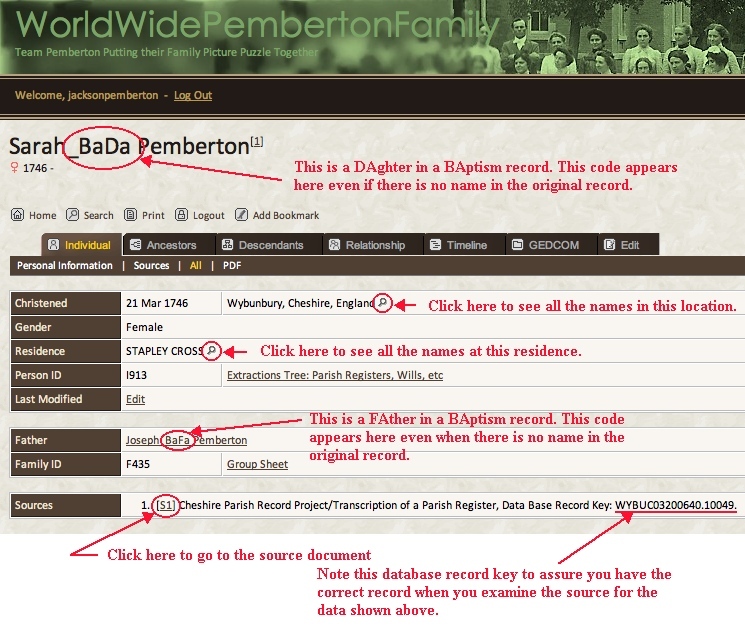 This shows how a simple baptism record is enhanced and displayed in a typical genealogical presentation mode. The names are tagged so that the researcher immediately sees what kind of data he is looking at. The genealogical engine makes navigation among records and juxtapositioning of similar records simple and powerful thus enhancing the discovery process for the researcher. To read more about how to use the Extraction Tree, select “Pemberton Genealogy” in the “Genealogy” menu on the left and look for “Using the Extractions Tree”. Notice that these codes open up whole new ways to search for information. For example: if you are looking for a baptism record where the mother’s name is Sarah, there is no need to search all the Sarah’s. You can find the one you want by searching for Sarah_BaMo. If you want all the Sarah burials, search for Sarah_Bu. Warning: if you are are using a partial code like this, be sure you choose “contains” and not “equals” for the search mode. What is Family History and what is Genealogy and how do you tell them apart? We often use the terms “Family History” and “Genealogy” interchangeably. The Pemberton Family World Wide is mostly this sort of thing and because it contain many many pages, it is helpful to have an understanding of more particular meanings for these words. Genealogy is certainly part of Family History, but it is a specifc part – namely, that part which comes from interpretations of facts contained in family history: those decisions that form family relationship links between family history facts. Hence, to be very specific, genealogy is strictly that information which has been derived or deduced by human judgement as being a familial link. Therefore, genealogical content on this website should either have these linkage decisions embedded in it, be dealing with such familial links, or be discussing how they are formed. On the Pemberton Family World Wide website, this is the narrow meaning of “Genealogy” that separates it from the more general section “Family History”. Of course, it is actually impossible to strictly adhere to this sort of rule, but it certainly is the guideline used on this website.